In most cases, you will likely still need a quality automotive solvent to assist in removing bonded tar deposits. 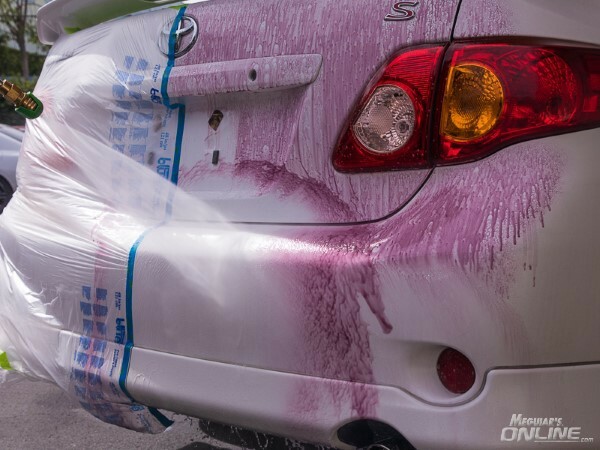 For paint, this is used on an as needed basis, and is not a substitute for a car wash, it is used in addition to a car wash solution. 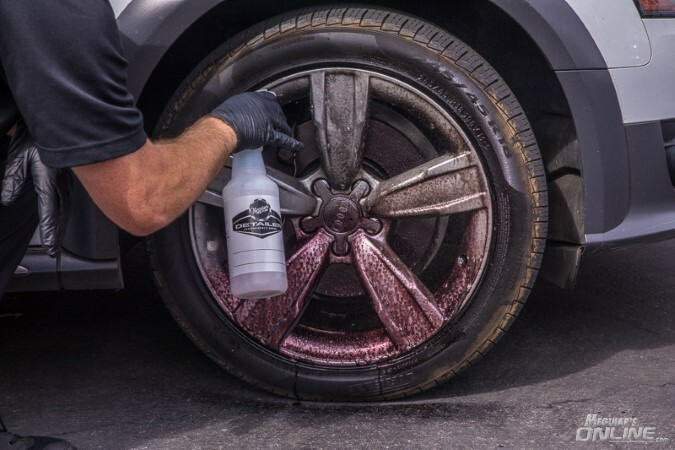 Here is the secondary bottle image, heard some feedback yesterday from a reputable detailer that this is by far the best wheel cleaner he has ever used! Apparently he had some sort of brown rust stain on wheels of his own, which he tried everything to remove. Well after one application of Wheel & Paint Iron Decon, it removed the stain & "made the wheels looks brand new." Here are a couple pictures from an upcoming video we filmed on this product! The white car below went from a light due of yellow to a crazy bright white! It was really impressive! The audi wheels at the bottom started turning purple before I could even finish spraying the entire wheel down! When will this be available for purchase? Do you use it straight out of the gallon or will it be diluted? Meguiar's Professional Wheel & Paint IRON DECON is showing up on some online detail product websites. Two that I checked have estimated ship dates of 30 Nov 2018 for the one gallon size. Check with your favorite provider for their availability. The product specific screen printed secondary 32 oz refillable bottle appeared on one site with a Dec 16 estimated ship date. To keep the viscosity the same, I doubt it will be a concentrate. Meguiar's D1801 Professional Wheel & Paint Iron Decon is RTU (Ready to use) and not a concentrate. However, the first ingredient on the label is Acetic Acid. This is also the acid commonly found in vinegar. Based on the molarity of the acetic acid, it can go form a substantial acid to a very watered down state near water. Since my polished alloy rims can tarnish with acid, could you provide the PH of this new product? We would not say it is safe on all wheels & painted brake components if we were not confident in that statement : ). The pH is 6.3 - 7. Keep in mind all the typical recommendations when using wheel cleaners. Use on a cool to the touch wheel, work on one wheel at a time, do not let the product dry on the wheel, & rinse thoroughly.